The most famous of all Dark Angels Interrogator - Chaplains. A moment of clarity as the most experienced Interrogator Chaplain removes his death mask for prayer to the emperor. Wargear: Asmodai is armed with Master Crafted Crozius Arcanum and bolt pistol, frag and krak grenades. Hunt the Fallen: If Asmodai is present add +2 to the D6 roll to see if the rule comes in to play. If any other special character also has a similar effect the outcome is cumulative. 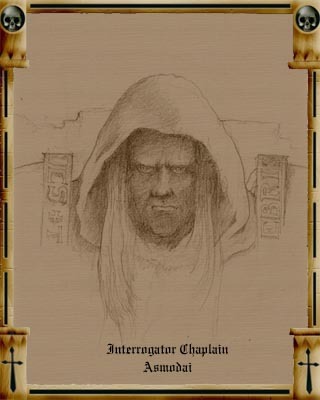 Asmodai isthe oldest and most experienced of all interrogator chaplains within the Dark Angels chapter. His feats on the battle field are so legendary that when foes know of his presence it has a a tremendous impact on their psyche.